Mothers PowerBall Combo includes both Mothers PowerBall Polishing Tools - the PowerCone and Original PowerBalls! Can’t pick a PowerBall? Have we got the kit for you! Mothers PowerBall and PowerCone put a whole new spin on polishing! Both are made with dense, flexible foam and both work with your electric drill. They both bring out a dazzling shine on metal surfaces. Compared to hand polishing, there’s no comparison! The only tough decision may be which PowerTool to choose. Problem solved. 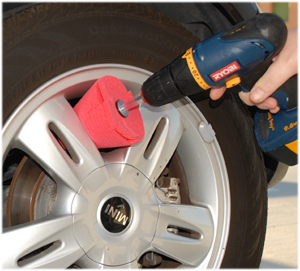 The Mothers PowerBall Combo includes the PowerBall and PowerCone, plus an assortment of products to give your metal wheels and trim a spectacular finish. Having both of these PowerTools allows you to polish large metal fixtures, like bumpers, and intricate pieces, like motorcycle pipes, with equal ease. Reach into concave, cramped, and curved spaces to remove oxidation and dullness from any polishable metal surface. These high quality microfiber towels are for drying, buffing away residue, polishing or shining. 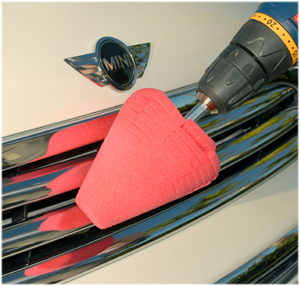 Use the towel to buff metal surfaces following polishing with Mothers PowerMetal Aluminum. The thick microfiber will grab all residues and leave the surface clean, streak-free, and shiny. The entire Mothers PowerBall Combo Kit is priced at less than the value of two Mothers PowerCones. Its like getting the polish, towels, and gloves for free! That’s just one more great reason to take advantage of this excellent value. These items have a total retail value of $81.95. Save $21.96!